Satsuki in human form appears at the entrance looking for the Magic Sword "Makoto". If you find the Magic Sword "Makoto" and give it to Satsuki, he will attack you. After you've killed him, he will drop the sword for you to pick up. If you find the Magic Sword "Makoto" and decided not to give it to Satsuki, he will attack you. If you find the Magic Sword "Makoto" and have it equipped, when you talk to Satsuki, he will attack you. Remember that killing Satsuki shifts World Tendency by -3. Black Phantom Satsuki shows up at the entrance. He drops a Hiltless when killed. Pure Black World Tendency required. Your starting position. Note the green markers on the map, these are the pressure plate traps, while the dotted green lines are the trajectories of the bolts fired when the trap is triggered. When you first walk forward you will see a Silver Skeleton rise. These guys roll around a lot, and can hurt you with the spikes on their bodies. Watch out for their overhead guard breaker attack and forward thrust attack. Both have a pause before being unleashed, so back up. They are weak to Blunt damage. Magic works alright as well. Note the healing Grasses on the backside of the gate. Also, if you look closely you can see Satsuki standing above the gate. He'll come down with White Tendency, or come down as a Black Phantom with Black Tendency. Advance slowly along this staircase so that you do not draw the attention of more than one rolling Skeleton. Also, the archer here fires magical arrows. So do not block too many shots with basic shields, dodge instead. Occasionally these archers will drop the powerful Holy Arrows for you. There are several items in this area, a Talisman of God, a Soul, and some Lotuses to stop any Bleeding you incur from the enemies here. Be wary of the two archers on top of the fog gate. Shoot them with arrows or magic, or proceed through the gate and come back for them. "Hey Ugly, I know you!" The tutorial boss makes his sad, much weaker return. The same tactics apply. Stay behind him with melee and use your better weapons to crush him. Alternatively, he won't move from this spot if you attack him from the edge of lock-on range with any type of projectile. Also, there is at least one Manta/Storm Beast that flies overhead and might attack you. So kill it first if you don't want to get blindsided by a giant barb. The green marker and dotted line denote the first pressure plate trap that you can encounter on this map. Stepping on the plate releases a series of 3 metal bolts down the middle of the hallway. Hug the wall and you should be alright. Raise your shield just to be safe. Turn towards your left if you want some treasure and are confident that you can best or evade the enemy there, otherwise climb the stairs. Before you can claim your Crescent Falchion +1(MP regen and magic damage when attacking) you must face the Black Samurai Skeleton. This bugger is tough, uses combination attacks, deals a lot of damage, and can break your guard. Projectiles are recommended for dealing with this threat. Otherwise lure him towards the stairs, climbing up them yourself, then dropping back down when he follows. Grab the items out here and you can drop to the starting pathway below you to evade him. You can also kill him from point 2 by using a bow, he will squirm around so it may take quite a few arrows to finish the job. This point is at the top of the staircase near points 5 and 6. Note the Silver Skeleton up here on the right. He will attack as you get up to this top landing. Beat him and proceed down this walkway. This spot, besides leading down to the Copper Key to free Blige, is the shortcut to get the Regenerator's Ring. Roll off the top towards the broken wall to get early access to the ring. However… this area puts you right before the boss, and you cannot return due to a fog gate that faces the opposite side. So you either have to fight the boss, use Evacuate or a Shard of Archstone, or suicide, or wait and come around the legitimate way. There is another pressure plate trap here. Carefully walk around it to avoid unleashing a hailstorm of bolts. Grab the Copper Key by the closed gate here, as it will let you free Graverobber Blige elsewhere in this level, your best source for many kinds of arrows. Travel along the other side and you'll drop under an archer Silver Skeleton and go into a tunnel. A Silver Skeleton will attack after you round the corner, and there is another in a small staircase to the right of the next room. This staircase leads to a seeming dead-end. But that green line marks an illusionary wall. It looks like an archway with wavering stones. Attack it to open the archway. But going from this direction leads to a double ambush. So leave it alone for now. As you climb the other set of stairs towards this point, a Silver Skeleton will ambush you along the way. Usually this guy rolls harmlessly over your head and lands with his back facing you. Get in a critical strike, or just bash/slash away until he dies. This outside area is the 'Give me shiny, Give my sparkly' Crow. Check out the Crow page for a list of trades. Drop a single desired item(a single quantity of that item only), to which the crow will respond verbally in the positive, and leave the map(or quit game and reload). The new item will be available for pick-up at the right side of the tree, behind an upraised root. Also, you can drop off the side here to hunt that Crystal Gecko. The item is a Stone of Ephemeral Eyes. This spot leads towards that double ambush mentioned in point 10. I suggest going back outside to where the Vanguard 'tutorial' boss was and dropping down into the open pit in the ground. Attack the illusionary archway there and you will be at the end of the tunnel, behind one of the ambushers. Use the Copper Key here to unlock Graverobber Blige. This vendor sells lots of arrows. You can also purchase basic Leather Armor here, which has a decent defense to weight ratio. If you took my advice and dropped down the pit behind the Vanguard, you'll end up at this point(or if you are exiting via this path after beating the double ambush). There is a pressure plate trap here, so hug the left wall again to avoid the arrows. Before going through the fog gate and climbing the staircase to this point, look to the left to get some Shards of Cloudstone and Soul. Once you've looted this area, climb on up. Notice the ladder on your left. You can climb this to get some items, cross that wooden plank up here to get to the rest. Also, there is a Black Skeleton to your left as you approach the Silver Skeletons. He guards an Adjudicator's Shield. This shield blocks 90% of melee damage and 50% of magic damage. But, more importantly, it regenerates your HP when equipped, just as a Regenerator's Ring or Blessed weapon would. There is a pressure plate trap here, but the bolts come from behind you. You can also roll off the wooden plank after the top of the ladder mentioned in point 15 to avoid this plate altogether. Also, before you drop down completely toward the pathway below, hug the wall on the right and you will find a Soul. A somewhat tricky spot. Around this blind corner is your first Golden Skeleton encounter. These guys carry massive two-handed cleavers, meaning that they don't flinch from small melee attacks. Their Golden status makes them resistant to weapons as well. Magic damage tears through them easily enough though. Also, there is a Manta/Storm Beast here, flying overhead, that will attack you several times as it passes by on patrol. This room is the last major junction before approaching the boss. First you want to climb the stairs here. As you come back around you'll notice an item on a small side section, with a wooden beam leading towards it. This is the Graverobber's Ring, which partially hides you from Black Phantoms(very important if you play with Black World Tendency). You can walk through the broken wall up here to get a Soul as well. This second doorway is the 'intended' path towards the Regenerator's Ring, and to a Crystal Lizard. So you might as well grab the ring if you haven't already. Look out for one last pressure plate trap as well. The last obstacle before you reach the boss. There is a Black Skeleton here, at the bottom of the stairs. This long hallway practically begs for you to use projectiles on him. Feel free to let him chase you a bit, as you can run to Point 18 to escape. The Adjudicator boss. See the Adjudicator link for more information. There's a shortcut to get to Adjudicator location from near the start of the level, but it requires carefull rolling. So make sure you aren't burdened before attempting it. You don't have to sprint at the wall, and some have done it from a standing start at the right place. When you enter 4-1, and you encounter the two archers shooting from above the first fog door, there's a tower to the right that you can access by climbing the stairs in the left tower and going across the rampart where the two archers are. Remember, at the bottom of the right tower is where you pick up the copper key to free Blige, and there is a trap down there if you fall down. As you walk onto the top of this right tower from the walkway, you can go left around and down the stairs, or if you look right towards the far corner you will notice a part of the wall that is crumbled and is missing some blocks. From the top of the tower, if you run and then roll toward the broken part, you will land on top of the tower wall instead of falling onto the stairs. Sometimes you will see a message on the ground like "Run Here" , and sometimes people leave a message on the top of the wall where you should aim to land. Once you're there, look down and see where the wall below separates the starting area on the right (where you picked up the Talisman of God under the tree), and you can fall down to your left (down to where the HP regeneration ring is). This left path will take you right next to the area with the last staircase down to the Adjudicator (and it's a great way to rush the crystal gecko on the ledge). Video of shortcut. Unlike the previous shortcut, this can be done even while wearing heavy armor. Climb the ladder at the top of the stairs right after the second fog (behind Vanguard), and cross the broken roof to the beginning of the plank. Climb onto the crenellations here and roll straight out towards the ocean; you will land on the crenellations below. From here you can drop down into the courtyard beyond the penultimate fog of the level, right before the Adjudicator. You can also walk around on the crenellations for a better view of that part of the level. It is also possible to do this shortcut by running off the crenellations, without rolling, but that is not as easy. There is a secret way that allows you to pass through the level easily without activating any of the fog gates which enables you to deter black phantom invaders from following you. 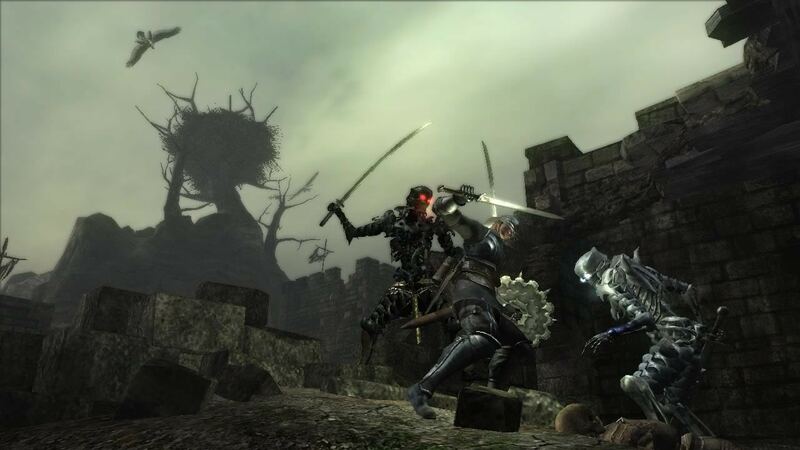 This process involves a running roll up a stone railing on the stairs by the first fog gate and up onto the platform with the first dual katana wielding black skeleton. (Near where the crescent falchion +1 is located). To see a demo of this shortcut please view this video. Video of shortcut.